Over the Memorial Day weekend, I took a camping trip to Red River Gorge in the Daniel Boone National Forest. 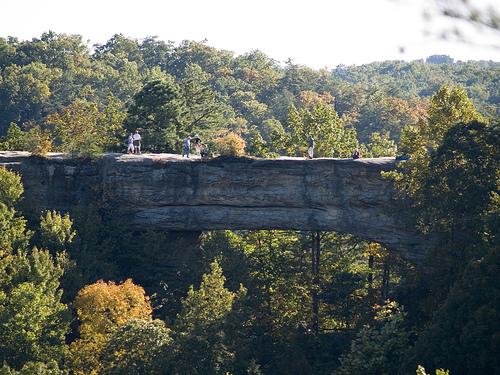 The forest is a collection of federal, state and privately run parks stretching across 8,000 square kilometers of Kentucky, almost a 10th of the state. It is named after the famed 18th century explorer, who claimed to have once killed a ten-foot tall hairy man-beast he called a "Yahoo" (1). There is even a place within the forest called "Yahoo Falls." (2). Despite reports of Bigfoot in our area, (3, 4, 5), we had about as much luck seeing one as the people from Finding Bigfoot. We did, however, see a deer. Saturday afternoon, following a morning of canoeing and cliff-diving (6) on the Red River, we hiked up to Natural Bridge (7), a sandstone arch 75 feet long and 65 feet high. Exhausted from the day’s activities, three of us decided to take a chair-lift back down the hill. My girlfriend and I were in one chair, while her brother took the chair in front of us. During our slow and terrifying (8) 600-foot descent down the hill, I clutched onto the railing for dear-life against the slightest breeze, spending most of the ride with my eyes squeezed tight. If I was a praying man, I would have been doing just that. I did open my eyes just in time to watch a deer bound across the gash cut through the forest by the chair-lift machinery. From one side of the trail to the other, it took the deer just a few seconds to make it across. Though I had a camera with me, I was not quick enough on the draw. It was an adult Southern white-tailed doe, brown with no markings on her. Except...my girlfriend saw an older juvenile, still bearing white spots across its back. Except...her brother saw a buck, velvet antlers starting to sprout. How is it that three people can witness the same event yet come away with three separate perceptions of it? This illustrates a problem discussed in previous columns, the fallibility of eye-witness testimony. While we laughed at our different perceptions at the time and talked about it no further, I am sure my girlfriend, her brother and I could come to some sort of consensus on what exactly we saw. But finding a consensus does not mean we found the objective truth, no matter sure we may be, no matter how our memories, malleable and faulty things they are, may have changed when finding that consensus. One can see how this relates to claims that a paranormal event is more credible when witnessed by an arbitrary number of people who agree on what they saw. This story also illustrates the weakness of anecdotal evidence. There is no way to verify one bit of it. Sure, I can show you ticket-stubs for the chair-lift, a receipt from the great pizza-place we stopped at, or photos from the trip. But as for the deer, you don’t know for sure if we saw one. I could be making it up. 1. Appalachian History - Yeahoh, Yahoo or Bigfoot? 2. I have no idea if the falls are named after the Boone’s hairy man-beast, but I want to believe. 6. Okay...it would be better to say, I cliff dove, once. Standing there 30 feet over the water, and being scared of both heights and deep, murky water, it took me quite a bit of time to jump, much to the frustration of my friends.